Hanada Katsuji (1928~ ) was an 18-year old longshoreman in Muroran, Hokkaido when he was spotted by rikishi Onoumi, who was in Hokkaido on a sumo tour. Under the sumo name of Wakanohana, he joined Onoumi's Nishonoseki heya (stable), also home to makuuchi (the top division) rikishi Rikidozan (1921~63) who later went on to become Japan's first TV star and pro-wrestler. Under Rikidozan's strict guidance, Wakanohana soon rose through the divisions, becoming the first postwar new makuuchi rikishi (wrestler) in 1950. Small by sumo standards at no more than 109 kilograms, he relied on an uncanny ring sense and remarkable technique that earned him the nickname 'devil of the dohyo'. He developed a famous rivalry with the similarly-built rikishi Tochinishiki. Their all-out bouts during the 1950's rivetted millions of people across the country on radio and the newly emerging medium of TV. It continued through the decade until Tochinishiki retired in 1960, Wakanohana in 1962, both at the top rank of Yokozuna (grand champion). After retirement, Wakanohana started his own heya under the oyakata (stablemaster) name of Futagoyama. He trained two yokozuna and two ozeki (the second-highest rank). One of the ozeki was his own younger brother Hanada Mitsuru (1950~ ), who rose to the top division as Hanada at the record age of eighteen before changing his name to Takanohana. Although he never reached the very top rank, Takanohana was immensely popular, his handsome, soft-spoken look earning him the nickname 'prince of sumo'. Small in stature like his brother, he developed a David-and-Goliath rivalry with the bigger yokozuna Kitanoumi, unpopular due to his arrogant image. After a record fifty straight basho (tournaments) at the ozeki rank, Takanohana retired in 1981 and later started the Fujishima Beya and went on to become director of the Japan Sumo Association. It was at the Fujishima Beya that the third generation of Hanadas appeared, this time two brothers, the elder Wakahanada (1971~ ) and younger Takahanada (1972~ ). As the latest members of sumo's most famous dynasty and obviously immensely talented, they became overnight media darlings. Takahanada, younger by 18 months but with an ideal sumo physique, stole the spotlight by reaching makuuchi at the age of seventeen, beating his own father's record. 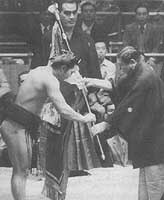 The smaller and shorter Wakahanada arrived in makuuchi 4 months later with the help of technique and ring sense to rival that of his uncle. The brothers went on to change their ring names to Takanohana and Wakanohana and to achieve the rank of yokozuna. Takanohana was first again, by 4 years, and was the dominant force in sumo in the 1990's. He had a career total of 22 yusho (tournament victories) to Wakanohana's 5. When Fujishima Beya and Futagoyama Beya merged in 1992 (under Fujishima oyakata who changed his name to Futagoyama! 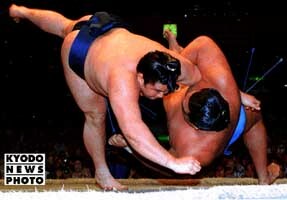 ), the most powerful heya in Sumo was born. Many objected to the merger because the fact that stablemates don't fight each other (except in the case of a final-day play-off) gave the Futagoyama rikishi an unfair advantage. But over the years, the private lives of these young princes of sumo became the subject of speculation and scandal and the younger Takanohana seemed to suffer more from the pressure. He was never forgiven by many fans and members of the close-knit entertainment world for a broken engagement to popular teen idol Miyazawa Rie in 1993. In 1999, his almost robotic persona and, more worryingly, his faltering performance in the dohyo invited claims of brainwashing by a shadowy Svengali-like figure. Both brothers married older women, Takanohana a former TV news anchorwoman and Wakanohana a model. Marital crises for both brothers and an ongoing feud between them became popular media fodder. As if that wasn't enough, their parents divorced very publicly, their mother returning to her stage name of Fujita Noriko. She published a book and appeared on TV, prepared to reveal anything and everything about the shadowy sumo world. She talked about the life of an "okami," who is a kind of substitute mother for the wrestlers and has to cook and care for them seven days a week. After suffering an injury on the tenth day of the September basho in 1999, Wakanohana had become only the second Yokozuna to suffer makekoshi (a losing record) in a 15-day tournament and talk was rife of his imminent retirement at just 28 years of age. With the arrival of new young talent from the Musashigawa Beya and abroad at the end of the 90's and the eventual retirement of Wakanohana in early 2000, there was talk of an untimely end to the Hanada dynasty. Waka gave up on sumo altogether, and changed his name back to Hanada Masaru. He tried out - unsuccessfully - for the NFL before becoming a regular on TV. Takanohana's ultimate decline was caused by persistent injuries, especially to his knee. Even a trip to a surgical specialist in Europe couldn't undo the damage of years on the dohyo. The final nail in the coffin may have been his dramatic yusho-clinching win against rival Musashimaru on the final day of the 2001 Tokyo May tournament. Having lost to "Moose" that day to set up a play-off bout, Taka was bloodied and seriously limping. With his left knee bandaged up, he wasn't given much chance of fighting, let alone winning. But a display of pure grit saw him defeat the bigger man -- but at what cost? The next couple of years saw him sit out a record six consecutive basho only to be injured again on his comeback. He could still be a formidable opponent but was a shadow of his former unbeatable self. He finally admitted that his career was over after the 2003 New Year basho. He will be remembered as one of the great yokozunas but questions will remain about what could have been. Following the death of their father in early summer 2005 after almost two years of illness, the rift between Takanohana, who had become an oyakata, and his elder brother moved back into the media spotlight. The elder brother gave the oratory at his father's funeral, as is the Japanese custom. But Takanohana felt that he should have had the honor, as his brother had walked away from sumo. There were also the inevitable rumors of disputes and disagreements about their considerable inheritance. To everyone's surprise, a lean and younger-looking Takanohana usurped his brother's role, becoming the one who appeared day after day before media cameras, perhaps in a last-ditch attempt to redeem his public image. Fortune, fame and constant media attention have taken their toll on this family. No one else has come along to take over as the Japanese "royalty" of sumo. So it may be a little early to say that the "House of Hanada" has really fallen. But unless the brothers can produce some sumo offspring of their own, its days may be numbered.